File cabinets belonging to Marilyn Monroe which "disappeared" after her death have been found, and they've been rifled through for the public's viewing pleasure! 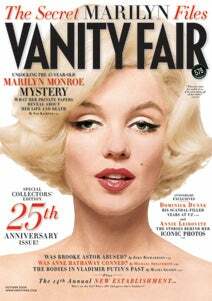 Vanity Fair has dedicated quite a bit of Internet real estate to "The Marilyn Files," as well as the cover of its October issue. Writer Sam Kashner tries his best to infuse the archive with mystery: "Who owned it, where did it come from, why did [Monroe's husband Joe] DiMaggio want it out of the house?" he asks. Kashner describes the experience of being driven to the house in L.A., owned by an unnamed, "Howard Hughes-ian figure" as "all very hush hush. "Much of the "side of Marilyn that no one has ever seen before" includes ordinary things like receipts, telegrams, bottles of Chanel No. 5, and checkbooks. Does this stuff just seem mundane in this day and age, because we live in a celebrity culture where we know all about Britney's meds, Lindsay's post-rehab life and Paris Hilton's Valtrex prescription? Marilyn Monroe was a star when a star actually meant "star": A sparkling, untouchable, heavenly body. So why is everyone so excited about bringing her down to earth? Part of it is curiosity about how this Icon lived. She was so many women rolled into one. She had recipes! She had diamonds! She had fan mail! But there are also just so many secrets. (Were there love letters from President John F. Kennedy? Signs point to yes). Sam Kashner's story is epic, extremely long, but worth reading. The truth is, we will never know everything about Marilyn Monroe — and many of her papers were burned after her death. And honestly, much of this exposé seems a bit sad: Men grasping at remnants of paper a beautiful woman left behind. Some of it mundane, some extremely personal; all of it never meant to be seen by the public. As for Mark Anderson's exquisite photographs of Marilyn Monroe's belongings: "You can tell a lot about a woman from the things she left behind," the VF subhead reads. And some of the most lovely images are not of her bookstore receipts or telegrams, but of her clothes and jewels: The trappings of a bona fide movie star. But maybe that's because these items seem to celebrate her in a way that elevates her, Instead of grounding her?